We know that bariatric surgery alters the size of the stomach, creating a new stomach pouch. This pouch naturally stretches a little over time. But, with the right eating habits, this stretching of the new stomach can be kept to a minimum. 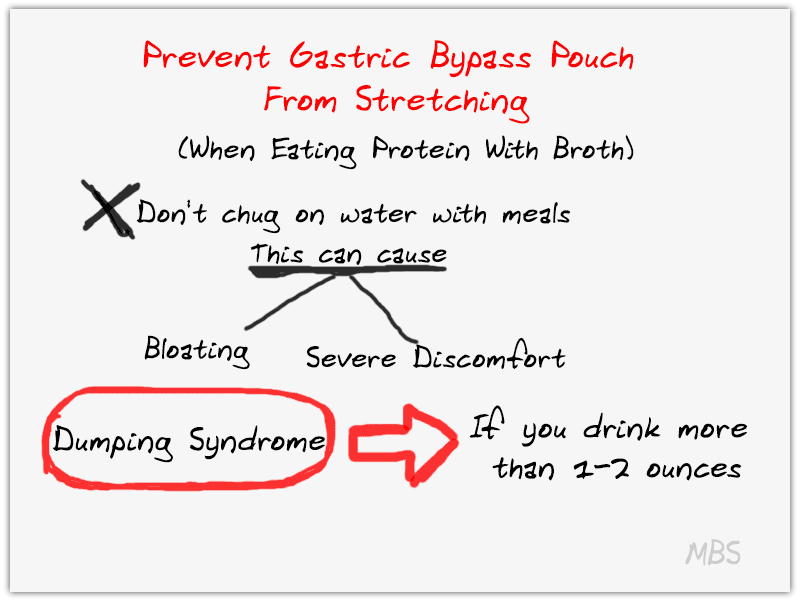 Does eating protein along with a few sips of broth stretch stomach pouch after gastric bypass? What is the difference between eating protein and a sugar-free popsicle vs. eating protein and a sip of water after gastric bypass? Doesn’t the sugar-free popsicle melt into the flavored water? What about eating a few bites of protein and a few sips of broth? Isn’t that like drinking water with your meal which might result in the stomach pouch getting stretched after bypass? This is a good question as it confuses a lot of people. Having a couple of sips of water or sucking on a popsicle after having a protein drink is not going to stretch your pouch. The big thing we want is for you to avoid “chugging” water with meals or drinking too much water which may cause bloating and severe discomfort. Most of us are in the habit of washing down a meal with water or a glass of milk, and that can’t happen after gastric bypass surgery.